In his New York Times magazine profile of Barack Obama, political writer Matt Bai explains the Obama “50-state” campaign strategy. Explaining his 50-state strategy, Obama told Bia that the first thing he had to do was “show up”. “Elko?” I asked twice, straining to hear him over the engine noise. “E-L-K-O.” He sounded vaguely annoyed, as if I had just confirmed something about the media he had long suspected. “That, by the way, is the reason we got more delegates out of Nevada, even though we lost the popular vote there during the primary. We lost Las Vegas and Clark County, but we won handily in rural Nevada. And a lot of it just had to do with the fact that folks thought: Man, the guy is showing up. He’s set up an office. He’s doing real organizing. He’s talking to people. A large amount of campaign funds was required to implement the “50-state” strategy, funds that have managed to inform the entire nation that the Republican brand has been denigrated and is need of repair. Obama’s ability to generate a steady income stream from the internet gave him both cash and volunteers, especially from younger voters, the kind that wrote checks for $50 and then signed up for the duration, agreeing to travel from state to state to promote a candidate who had inspired them with his promise of change. For example, volunteers who had swept Obama to victory in his home state of Illinois quickly signed up as door-to-door workers for primaries in nearby Wisconsin, Indiana, and Pennsylvania. They bolstered local volunteers in the primaries and gained experience for the general election. After the nomination, these volunteers emerged as hardened veterans, sleeping on the floors of local Obama activists in nearby states, registering voters, and then organizing “get out the vote” teams to push early voting and then bring the rest of Obama voters out on November 4. Obama’s volunteers are not all young, One African American volunteer in Boulder, Colorado, Charles, an 86 year old man who speaks with the accent of the Deep South, gave his testimony as to why he is working for his candidate. Watch it here on You Tube. Obama will not win every state’s electoral votes, but House and Senate Democrats in Red states will benefit from Obama’s coattails, And they will benefit from volunteers like Charles the Volunteer from Boulder. Democrats have never won Alaska’s electoral votes, but thanks to an aggressive Obama effort in the Red state furtherest north, the voters there are primed to replace a convicted felon from the US Senate with the Democratic mayor of Anchorage. Alaska voters got considerable encourage from a jury verdict against long-time Republican Senator Ted Stevens in a Washington, DC US district court. It must also be noted, the voters got an assist from the decline in the Republican brand nationwide, thanks in part to the Alaska governor’s less-than-successful campaign. He told me, when we talked, that Washington’s us-versus-them divisions had made it impossible for any president to find solutions to a series of generational challenges, from Iraq to global climate change. “If voters are similarly polarized and if they’re seeing two different realities, a Sean Hannity reality and a Keith Olbermann reality, then we’re not going to be able to get done the work we need to get done,” Obama said. Obama’s call for “change” is a call to move beyond the “us-versus-them” divisions. Polls suggest that it is a division that no longer resonates with the majority of voters. But like survivors of a shipwreck, McCain’s campaign and his bigoted support teams, are shooting holes in the bottom of their life boats. With less than a week to go, the McCain effort has fallen back on “us-versus-them” tactics by trying to link Obama with people in his past that Obama detractors identify as denizens from the Dark Side. The Jeremiah Wright videos have surfaced once again in some swing states. Bill Ayers continues as a tool to generate fear. Most recently, respected Middle East scholar Rashid Khalidi, formerly of the University of Chicago and now based at Columbia Univerity in New York City, has been condemned as an “anti-Israel” figure (not true) who is friend and who is an “associate” of Obama (true). The failed “us-versus-them” motif used against Khalidi has been hauled out by the McCain camp through a wild, screeching cry of “show us the tape” directed at the Los Angeles Times, which has acknowledged the existence of a tape of a talk Obama gave at a “going away” 2003 dinner for Rashid Khalidi in Chicago. The “us-versus-them” crowd has an anti-intellectual bias that exposes them as a neanderthal crowd that sees enemies on campuses where free expression is cherished and complex issues are explored. I refuse to believe that they represents anything other than a small minority of haters who are desperate to hold on to their simplistic “us-versus-them” mantras. I give them this, however. In their zeal to cling to their worldviews, they do their homework. Somehow, someway, this crowd got a list of attendees at the Khalidi dinner in 2003. They must have decided that since I was there to hear Obama speak, I must be in possession of their much desired video, which the Los Angeles Times says does actually exist. And since I write this blog, they have been writing me Comments that demand that I cough up my copy of the video. Sorry people, no such luck. I have no video and, if I did, none of you would be provided with a copy. File it under the old intelligence category, “need to know”. I have never served in the CIA but I am a faithful reader of John LeCarre, including his latest venture into Middle East politics, A Most Wanted Man, Scribner, 2008. So I understand the meaning of “need to know”. In the leftist corner, if such antiquated distinctions still counted for anything, presided the urbane Michael Alexrod of Foreign Intellegence. Alexrod was a keen European, an Arabist . . .; and in the rightest corner, the arch conservative Dieter Burgdorf from the Ministry of he Interior, Alexrod’s rival to fill the post of intelligence czar once the foundations of the new structure had been laid: Burgdorf, the unashamed friend of Washington’s neoconservatives, and the German intelligence community’s most vocal evangelist for greater integration with its American counterpart. page 99, emphasis added. But I digress. That 2003 Khalidi dinner, by the way, was a festive occasion. My recollection, after five years have passed, is that if anything was mentioned regarding Israel, it did not register with me. And I tend to notice things like that. Of course, it was not what Obama said that night that has the McCain crowd demanding the release of the video. This is merely another “guilt by association” tactic which this crowd of “us-versus-them” believers want to use against Obama in these final days because he has “associated” with a noted Middle Eastern scholar. Well, the number of people who have “associated” with Rashid Khalidi is large. I am proud to be counted among them. A great many of us depend on Dr. Khalidi’s scholarship and his extensive study of Middle East politics to make sense of the complex history of Israel and its occupation of the Palestinian people. I am also proud to add that I have taught short courses on “Religion and the Middle East” in which I have recommended my students read Khalidi’s book, Resurrecting Empire: Western Footprints and America’s Perilous Path in the Middle East (Beacon Press, Boston, 2004). Sorry, all those of you who think I have an Obama video hidden in the vault, I am not only not going to help you find a copy of the video, but I am also not going to give you the list of students who have “associated” with Khalidi by reading his book at my suggestion. I do not think the Patriot Act requires that I release this information. Of course, I can suggest that if you want to learn more about the Middle East, one way to do this is to associate with Rashid Khalidi by reading his books, starting with Resurrecting Empire. 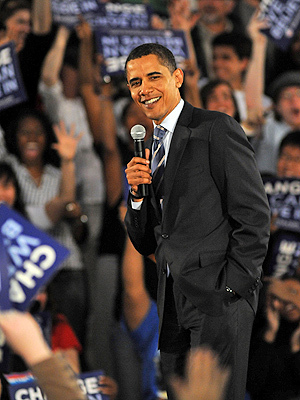 The picture above, of Barack Obama, was taken by Joe Raymond, of he Associated Press, during a rally at South Bend Washington High School, Wednesday April 9, 2008 in South Bend, Ind. It was published in the Los Angeles Times, April 10, 2008.
excellent article! the fear-mongering approach won the Reps the election in 2004 [i have to admit i was one evangelical who was duped]. the fear-mongering approach can’t work again, can it? What you fail to recognize is that there is a large group of sincere gentle loving Christians who live by Matthew 25:31-46. On the other hand, we also understand the Jews are God’s chosen people in the old testament and the restoration of Israel is part of God’s prophecy. We also understand that most of the opposition to Israel has to do with the hatred of the Jews by Muslims. The bible speaks about Ismael and God’s promise to make his children multiply and produce many nations…it also says he will be at odds with everyone as well. It’s not so much our opposition to Obama’s social values (although, they are at odds with Christian values), it is our fear of our leader having a sympathetic ear to a group of people that could put us on the wrong side of history/prophecy. You may call that fear, but we should fear God and respect what he says in his word. When Rick says opposition to Israel is about “hatred of Jews by Muslims,” he ignores the tremendous good-faith interfaith efforts on the part of Jews, Christians and Muslims to correct the injustice of Israeli *policies,* not Israel itself.